Ensure you are using the latest version of the Citrix Online plug-in locally. If not then uninstall it and proceed to the login site and you will be prompted to download and install the latest Citrix plug-in. Ensure you have version 10.3 or higher of the Adobe flash player installed locally on your machine. Inside your Hosted Desktop session you must be viewing the flash content using the Internet Explorer browser. Currently all the other browsers are not supported with HDX. Cookies must be enabled in Internet Explorer in your Hosted Desktop Session. Select Preferences from the black bar across the top of your screen. 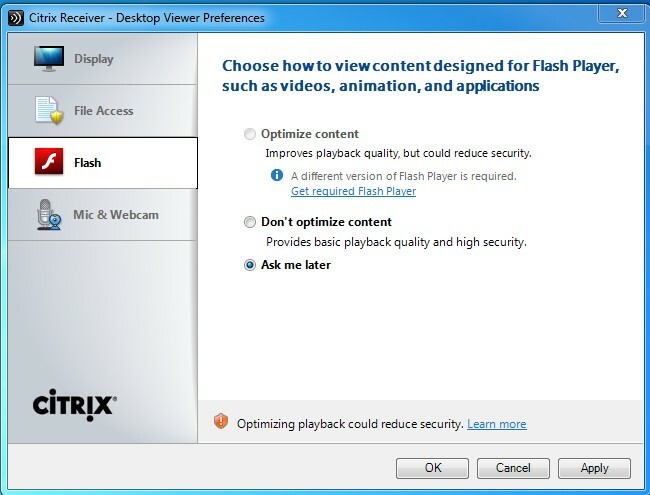 Note: If the Optimize Content option is greyed out you will need to select Get Required Flash Player, follow the download and installation instructions and then select the option.